Ben and Andrew keep meeting where they least expect. Some collisions are by design, but are they for a reason? Ben’s father would disown him for his relationship with Andrew, so they must hide their love. Andrew is determined to make it work, but secrets from his past threaten to ruin everything. Ben escapes to Zimbabwe to finally fulfill his lifelong ambition. But will he ever return to England? To Andrew? To the truth? When I first heard of this book, I was intrigued immediately. It sounded like something I would pick up but.. on the other hand, it also sounded like something I wouldn’t pick up – if you get what I mean. The LGBTQIA+ part of this novel immediately spoke to me, but I wasn’t really sure about the homophobic impression I got from the blurb. I’m glad I ended up requesting this ARC anyway because.. 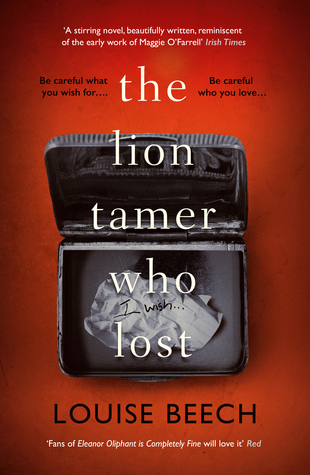 I don’t regret reading The Lion Tamer Who Lost one bit! So, of course, I’m starting with the thing I already mentioned. Both our main characters are queer. Of one them mentions being gay, the other never puts an actual label on his sexuality. Nevertheless, the LGBTQIA-representation is present and I absolutely loved it. Typing this, I’m reminded of the dedication at the start of the book, where Louise Beech thanks someone for telling her that “love is love, no matter who it’s between”. My day was made before I actually started reading, people. The settings of this novel is the second thing that blew my mind. Set in both the UK and at a lion reserve in Zimbabwe, I felt a unique vibe to this story. On one hand, you find yourself in a known, busy setting. A normal setting. On the other hand, you get acquainted with a place you might never go yourself. A lion reserve. It sounded amazing and wonderful, yet harsh and difficult at the same time. I was intrigued and could totally imagine seeing lion cubs and grown-up lions in their natural surroundings. Switching between those settings, you also switch between POV’s. You get both Ben’s and Andrew’s side of the story. Not only that – you also switch between past and present! Going from the now – when Ben finds himself in Zimbabwe – to the “back then”, where his relationship with Andrew unfolds and takes you on the journey as to how he ended up at the lion reserve. You’re dragged into their story and can’t help but feel for them as it unfolds. There are definitely some things I struggled with while reading, but.. in a good way because it added to the story and was necessary for Andrew and Ben to tell their tales. This might be spoiler-y but I believe it’s important to mention for those who might struggle with this more than I did. The main thing was how Ben, at a certain point, fights his own queer nature by doing things that – felt to me – went against the core of his self. Simply because he was too scared to come out. I really, really hurt for him and even cried at one point because I just.. couldn’t. The other – smaller – thing is the presence of his father, who Ben said is homophobic. It cannot be easy growing up with a person like that when you’re trying to accept yourself, let alone Ben’s fear of coming out because of it. Sure, these things might cause issues for other readers – I realize that – but I really believe those two aspects added a lot to the story and needed to be present. I can only conclude I absolutely fell in love with Ben and Andrew. The Lion Tamer Who Lost is a tale of passion, love, sacrifice, finding and accepting yourself written in a beautiful, enticing manner. I know this is something outside of my usual genres, but how do you feel about this? Would you read it? Are you intrigued by the synopsis? How do you feel about novels set in more exotic places like Zimbabwe? Do you prefer more known locations? i’d never heard of this before i’m going to have to check it out! !